If you are a fan of Halloween (which I know you are), and you have kids (which I know that you do), then you've clicked the right post! A real Halloween fan, just like yourself, must pass the knowledge of celebrating the All Hallows Eve to their spook-loving spawns. And what is the best way for that? Halloween kids costumes, of course! Now, if for some reason you lack Halloween ideas at this moment, the list that you'll find below is filled with epicly gore-geous Halloween costume ideas for kids. With these kids costumes, you can show your little ones how to be the best Meatballs and Spaghetti, a notorious Biker, or the infamous couple from Breaking Bad, to get the most candy possible. The best part with these DIY Halloween costumes is that you can absolutely make them yourself, being an excellent horror-loving parent, that you are. 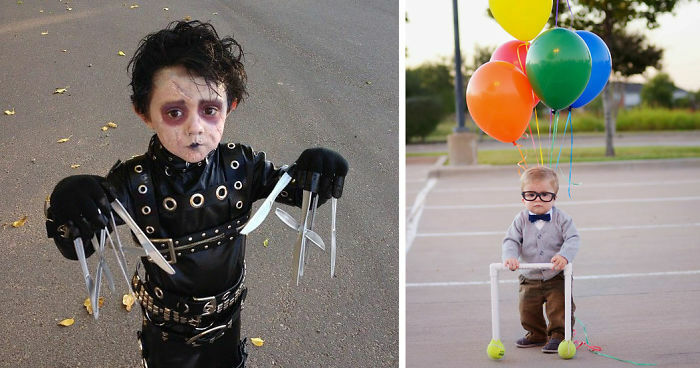 Now, scroll along for our collection of the best Halloween costume ideas for your youngsters. I bet Jack the Ripper himself couldn't come up with better DIY costume ideas, than those that we've gathered here! Awesome! But does the kid know who she's supposed to be dressed as? 76 down-votes? Have you guys lost the Halloween plot? Seriously this is awesome. But somehow flesh eating zombies are ok? So sweet, both of them! There you go....train them early to be a psychopath. Lol. You think it's a cute halloween costume until you realize which ones are the real legs.. I don't think this is really appropriate lol. Truly adorable. Tarsan to the next level. Love original costumes such as this. :). Great idea!! I think I still see the peace symbol under the blue. Maybe Spock was a closet hippie. #52 Old Man From "on Golden Pond"
thats the best werewolf i've ever seen!!! Sir, there's a baby in my taco..
No! Don't whack a me! It's amazing what you can do with a couple of old tshirts and some cardboard! How do you explain to a kid that young what his costume is about? Sometimes it's not age appropriate. must be hard to move in that! that must be really hard to make! #74 Her Name Is Leia (literally). Another hand-sewn costume I made for my daughter. No, very light! It was hard to walk in, but he insisted. My 8 year helped cut and place all the green squares on the boxes.